Xocai Nuggets - The Ultimate Healthy Chocolate Antioxidant Treat! Xocai Nuggets are a high cocoa content chocolate - 70% Cocoa. 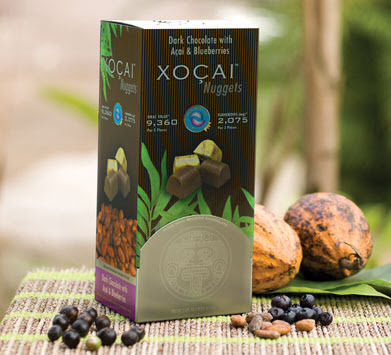 Xocai Nuggets were created by combining the exotic flavors of dark chocolate with Acai berries and Blue berries. Each 12 gram Xocai Nugget is made with rich Belgian Chocolate. A case of Xocai Nuggets consist of 100 Xocai Nuggets individually wrapped. You can conveniently order Xocai Nuggets by clicking on this Buy Xocai Nuggets link. Just like all Xocai Chocolate products, the Xocai Nuggets proudly display the ORAC value of Antioxidant Content on the case packaging. MxiCorp, the creators of Xocai Nuggets, are truly excited that they have created the Ultimate Antioxidant Treat with a balanced nutritional profile. The dynamic blend of cacao, acai berries, and blueberries makes Xocai Nuggets the most potent antioxidant product available! Xocai Nuggets has a patented unprocessed cacao optimized with Acai berries and Blueberries to create a high antioxidant formula unlike any other. Xocai Nuggets contain no artificial colors, no artificial flavors, no preservatives, and no fillers. Order Xocai Nuggets here today! Xocai Nuggets ORAC and Nutrition link.